The Union blockade during the American Civil War (1861-1865), which included the Blockade of the Carolina Coast, was a naval strategy by Washington to prevent the Confederacy from trading. The blockade was proclaimed by President Abraham Lincoln in April 1861, and required the monitoring of more than 3,000 miles of Atlantic and Gulf coastline, including 12 major ports, notably New Orleans and Mobile. Many attempts to run the blockade were successful, however. It was during the Federal blockade that England delivered sixty percent of all the Enfield rifles used by the Confederate Army. The transport of the much needed supplies to the Southern states was an invaluable contribution by the blockade-runners to the Confederate war effort. The blockade-runners were operated largely by British citizens, making use of neutral ports such as Havana, Nassau and Bermuda. The 500 ships commissioned by the Union would capture or destroy 1,500 blockade-runners during the course of the war. The Union Blockade of the North Carolina Coast was designed to prevent the passage of goods, supplies, and arms to and from the Confederacy. (See also Civil War Blockade Organization.) It refers to U.S. naval actions between 1861 and 1865 in which the Union Navy maintained a massive blockading effort on the Atlantic and Gulf Coasts of the Confederate States. 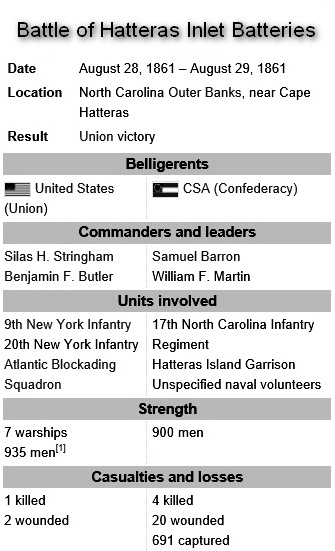 The Blockade of the Carolina Coast, a strategic objective early in the war, would include the Battle of Hatteras Inlet Batteries and was part of General Winfield Scott’s Anaconda Plan. "We feel defenseless here without arms... We see just over our lines in Virginia, near Suffolk, two or three North Carolina regiments, well armed and well drilled, who are not allowed to come to the defense of their homes... We are threatened with an expedition of 15,000 men. That is the amount of our seaboard army, extending along four-hundred miles of territory, and at no point can we spare a man, and without arms, we can not increase it... We have now collected in camps about three regiments without arms, and our only reliance is the slow collection of shotguns and hunting rifles, and it is difficult to buy, for the people are now hugging their arms for their own defense." The North Carolina Sounds occupy most of the coast from Cape Lookout (North Carolina) to the Virginia border. With their eastern borders marked by the Outer Banks, they were almost ideally located for raiding Northern maritime commerce. Cape Hatteras, located on the Outer Banks, is the easternmost point of the Confederacy and within sight of the Gulf Stream. Ships in the Caribbean trade would reduce the time of their homeward journeys to New York, Philadelphia, or Boston by riding the stream to the north. Raiders, either privateers or state-owned vessels, could lie inside, protected from both the weather and from Yankee blockaders, until an undefended victim appeared. Watchers stationed at the Hatteras lighthouse would then signal a raider, which would dash out and make a capture, often being able to return the same day. To protect the raiders from Federal reprisal, the state of North Carolina, immediately after seceding from the Union, established forts at the inlets, the waterways that allowed entrance to and egress from the sounds. In 1861, only four inlets were deep enough for ocean-going vessels to pass: Beaufort, Ocracoke, Hatteras, and Oregon Inlets. Hatteras Inlet was the most important of these, so it was given two forts, named Fort Hatteras and Fort Clark Fort Hatteras was sited adjacent to the inlet, on the sound side of Hatteras Island. Fort Clark was about half a mile to the southeast, closer to the Atlantic Ocean. The forts were not the most formidable of the Confederacy, however. Fort Hatteras had only ten guns mounted by the end of August, with another five guns in the fort but not mounted. Fort Clark had only five. 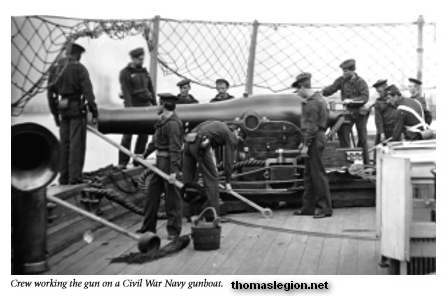 Furthermore, most of the guns were rather light 32-pounders or smaller, of limited range and inadequate for coastal defense. The depredations on Northern commerce emanating from Hatteras Inlet could not pass unnoticed. Insurance underwriters pressured Union Secretary of the Navy Gideon Welles for remedy. Welles needed no prodding. He already had on his desk a report from the Blockade Strategy Board suggesting a way to perfect the blockade of the North Carolina coast. The board recommended that the coast be rendered useless to the South by sinking old, useless, ballast-laden ships in the inlets to block them up. Soon after he received the board's report, Secretary Welles began to implement its recommendation. He ordered Commander H. S. Stellwagen to go to the Chesapeake Bay to buy some suitable old hulks. At the same time, he was told to report his activities to Flag Officer Silas H. Stringham, commandant of the Atlantic Blockading Squadron. As such, he was the naval officer in charge of the blockade of the North Carolina coast. This was the first involvement of Stringham with what was to become the attack at Hatteras Inlet. In time, he would become the most important person in the expedition. Stringham opposed the plan to block the inlets from the beginning. He believed that the tidal currents would either sweep the impediments away or would rapidly scour new channels. As he saw it, the Rebels could not be denied access to the sounds unless the inlets were actually held by the Union. In other words, in order to establish an effective blockade in this part of North Carolina, the forts that the state had set up would have to be captured. Since the Navy could not do it alone, the cooperation of the Army would be needed. As it happened, the Army was willing to cooperate. This was partially due to the political general Benjamin F. Butler, who was a political force that had to be dealt with, but was already emerging as a military incompetent. Butler was ordered to assemble a force of some 800 men for the expedition. He soon had 880: 500 from the German-speaking 20th New York Volunteers, 220 from the 9th New York Volunteers, 100 from the Union Coast Guard (an Army unit, actually the 99th New York Volunteers; the U.S. Coast Guard as we know it did not exist in 1861), and 20 army regulars from the 2nd U.S. Artillery. The men were put aboard two of the vessels that Commander Stellwagen had purchased, Adelaide and George Peabody. When objection was made that the two ships would not be able to survive a Hatteras storm, Stellwagen pointed out that the expedition could proceed only in fair weather anyway, as a storm would prevent landings. While Butler was gathering his forces, Flag Officer Stringham was also making preparations. Somehow he learned that the War Department orders to Butler's superior, Major General John E. Wool, had contained the statement, "The expedition originated in the Navy Department, and is under its control." Reasoning that he would be blamed if anything went wrong, he decided to follow his own plans. He selected seven warships for the expedition: USS Minnesota, Cumberland, Susquehanna, Wabash, Pawnee, Monticello, and Harriet Lane. All but the last were ships of the U.S. Navy; Harriet Lane was a cutter, part of the US Revenue Service. He also included in his force the tug Fanny, needed to tow some of the surf boats that would be used for the landing. On August 26, 1861, the flotilla, less Susquehanna and Cumberland, departed Hampton Roads and moved down the coast to the vicinity of Cape Hatteras. On the way, they were joined by Cumberland. They swung around the Cape on August 27 and anchored near the inlet, in full view of the defenders there. Colonel William F. Martin of the 7th North Carolina Infantry, commanding at Forts Hatteras and Clark, knew that his 580 or so men would need help, so he called for reinforcements from Forts Ocracoke and Oregon. Unfortunately for him and his garrison, communication among the forts was slow, and the first reinforcements did not arrive until late the next day, when it was too late. The Battle of Hatteras Inlet Batteries, sometimes known as the Battle of Forts Hatteras and Clark, was a small but significant engagement in the early days of the American Civil War. Two Confederate forts on the North Carolina Outer Banks were subjected to an amphibious assault by Union forces that began on August 28, 1861. The ill-equipped and undermanned forts were forced to endure bombardment by seven Union warships, to which they were unable to reply. Although casualties were light, the defenders chose not to continue the one-sided contest, and on the second day they surrendered. As immediate results of the battle, Confederate interference with Northern maritime commerce was considerably reduced, while the Union blockade of Southern ports was extended. More importantly, the Federal government gained entry into the North Carolina Sounds. Several North Carolina cities (New Bern, Washington, Elizabeth City, and Edenton among them) were directly threatened. In addition, the sounds were a back door to the Confederate-held parts of Tidewater Virginia, particularly Norfolk. The battle is significant for several reasons: It was the first notable Union victory of the war; following the embarrassment of First Bull Run (or First Manassas), July 21, 1861, it encouraged supporters of the Union in the gloomy early days. It represented the first application of the naval blockading strategy. It was the first amphibious operation, as well as the first combined operation, involving units of both the United States Army and Navy. Finally, a new tactic was exploited by the bombarding fleet; by keeping in motion, they did much to eliminate the traditional advantage of shore-based guns over those carried on ships. Butler and Stringham left immediately after the battle, the former to Washington and the latter accompanying the prisoners to New York. Critics argued that each was trying to gather credit for the victory to himself. The pair contended, however, that they were trying to persuade the administration to abandon the original plan to block up Hatteras Inlet. In Federal hands it was no longer useful to the Confederacy, and in fact now allowed Union forces to pursue raiders into the sounds. Although they and their supporters continued to press the case for several weeks, it seems to have been unnecessary. The War and Navy Departments had already decided to retain possession of the inlet, which would be used as the entry point of an amphibious expedition against the North Carolina mainland early the next year. This campaign, known as Burnside's North Carolina Expedition for its senior Army commander Ambrose E. Burnside, completely removed the sounds as sources of commerce-raiding activity. 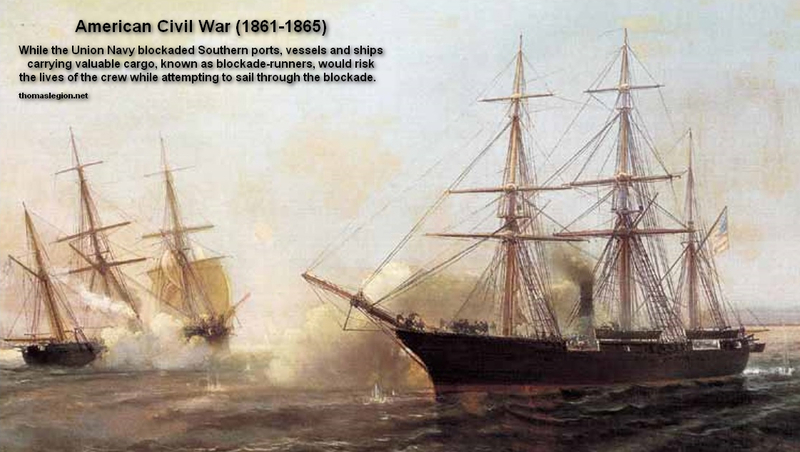 Recommended Reading: Confederate Blockade Runner 1861-65 (New Vanguard). Description: The lifeblood of the Confederacy, the blockade runners of the Civil War usually began life as regular fast steam-powered merchant ships. They were adapted for the high-speed dashes through the Union blockade which closed off all the major Southern ports, and for much of the war they brought much-needed food, clothing and weaponry to the Confederacy. This book traces their operational history, including the development of purpose-built blockade running ships, and examines their engines, crews and tactics. It describes their wartime exploits, demonstrating their operational and mechanical performance, whilst examining what life was like on these vessels through accounts of conditions on board when they sailed into action.